I am Elaine Mariani and I work as a massage therapist for horses. I was trained by Mary Bromiley FCSP, SRP, RPT (USA) - a practicing Chartered Physiotherapist for over 35 years and world renowned for her outstanding knowledge in this field as well as being founder of the Equine Sports Massage Association. I work primarily in the East Sussex area, as well as parts of West Sussex, Surrey and Kent. I spent a lot of my childhood hanging around yards hoping for the chance to lead a horse or muck out or just be near them. I received lessons as birthday or Christmas presents and in between I rode on the banister of the staircase using potato mashing tools as stirrups and read every book about horses I could lay my hands on. I was an adult when I bought my first horse and have never forgotten the anticipation of waiting for her to arrive. It was the most magical day of my life. At that time I worked in an office - first in computing and then personnel/training before taking time out to study to enhance my career. While on that break I took a job at a riding school to fill in time and that was the last an office saw of me. I was well and truly hooked. I went on to take BHS exams gaining the BHS PTT certificate and worked as a freelance groom for 10 years, while steadily accumulating a variety of horses to come live with me and be my raison d'être. 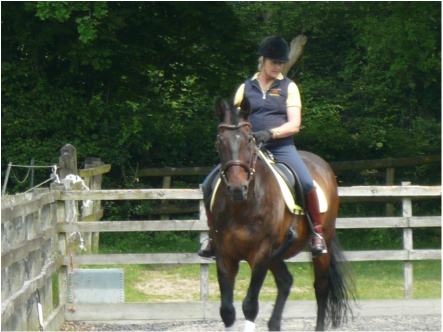 My horses and I have benefited hugely from complementary therapies and therapists over the years and gradually I was led along the path of wanting to be able to help horses in this way. I first learnt about energy work and I have found a great deal of peace in practicing it on others and myself. I find it useful to 'tune in' to a horse's energy as a preliminary to tuning into his or her body via my hands. It puts me in the right frame of mind to listen to what the horse's body has to tell me about its current condition and helps me to tune out what is happening outside of our bubble, which may intrude, on the conversation happening between my hands and the body of the horse. Once I decided I wanted to train as a massage therapist I knew I wanted to train with leading physiotherapist Mary Bromiley and as she requires her students to first study human massage, which is what I did. I obtained the I.T.E.C diploma in Holistic Massage for humans and surprised myself by how much I enjoyed the experience. I was thrilled to be accepted onto Mary's equine sports massage course and though it felt like a baptism of fire at times, I loved every moment of the course. Obtaining the I.T.E.C. diploma in Equine Sports Massage Therapy comes a close second to buying my first horse in the 'highlights of my life' stakes. I have since pursued a number of courses relevant to my career including Myofascial Release, Zoopharmacognosy and many others, as can be seen on my CPD page: Continuing professional Development (courses I have taken since qualifying). What a privilege it is to work with these amazing creatures. They have given my life so much meaning and I love being able to give something back. I thank all my horses for the path they have guided me along and for the life changing lessons they have taught me.